Singapore Property Market Cooling Measures are policies that were put in place by Singapore Government aiming to ease the property market. There are 8 rounds of cooling measures introduced since September 2009. The government’s campaign to rein in property values has led to decline in prices and demand. Do note that some of these polices are temporary and will be reviewed by the government based on the market condition. Below is a brief summary of all the cooling measures introduced since September 2009. We will update any changes both in our Property Market News Update page and here. applicable to purchase of residential properties (including residential lands) on or after 8 December 2011.
applicable be it the property is wholly, partially or jointly owned with others. the rate applicable depending on the profile of the buyer as at the date of purchase. the count of residential properties owned by the buyer. if residential properties and industrial properties are purchased on or after 20 Feb 2010 and 12 Jan 2013 respectively, SSD is payable if the properties are sold within the holding period. In the case of joint borrowers, financial institutions are to use the income-weighted average age of borrowers when applying the rules on loan tenure. HDB will only accept valuation requests from resale flat buyers (or their appointed sales person), after the buyers have been granted an Option To Purchase (OTP) by sellers. Reduction of Cancellation Fees From 20% to 5% for Executive Condominiums. Second timer applicants for executive condominiums (EC) to pay resale levy if they are purchasing an EC from a developer where the land was launched on or after 9 December 2013. Mortgage Servicing Ratio(MSR) has revised to 30% of a borrower’s gross monthly income. the MSR cap will apply to EC purchases from 10th December 2013 onwards. 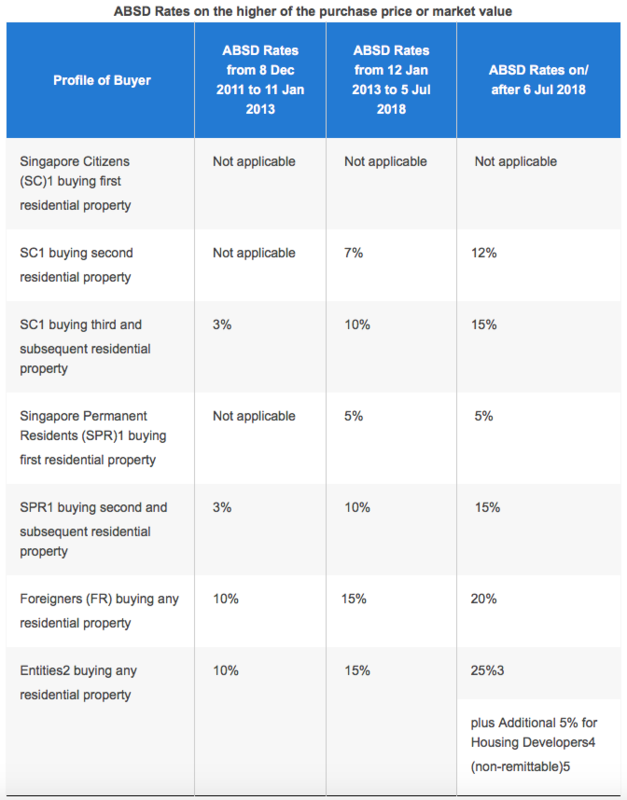 Singapore Permanent Resident(SPR) households have to wait for three years from the date of obtaining SPR status before they can purchase a resale HDB flat. SPRs no longer allowed to rent out entire HDB flat. Interest absorption scheme (deferment of instalments until TOP) and interest-only housing loans (interest payment only until TOP) were scrapped for all private properties. The government will now reduce the holding period for imposing SSD from the current four years to three years. 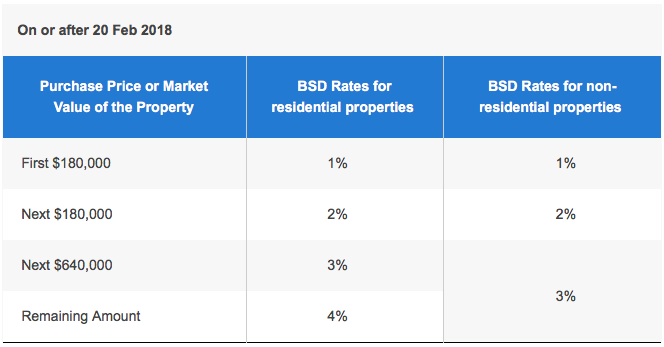 With effect from 20 Feb 2018, there are differentiated BSD rates between residential and non-residential properties. The BSD rate for acquisition of residential properties on or after 20 Feb 2018 is up to 4%. For purchasing of second or more residential properties, the ABSD rates for all other individuals will be raised by five percentage points and 10 percentage points for entities. Loan-to-value ratio limits for all housing loans granted by financial institutions will be tightened by 5 per cent. As from 1st April 2016, only those in special cases like an event of an owner’s death, marriage, divorce, financial hardship, renounced citizenship, and medical reasons will be allowed to make a change in HDB flat ownership.For example, couples who have agreed to transfer ownership to either person in the case of a divorce will be able to do so.Others who do not fall into any of these categories would be assessed on a case-by-case basis.